Guess began in 1981 as a book of styles by Georges Marciano. Maurice, Georges' brother, was first sought by Georges to help with product development. Armand and Paul, also Georges' brothers, were in charge of distribution and advertising, respectively. Armand ran distribution. Paul created the advertising, all of it in-house. Georges designed the clothes, burnishing Guess' signature style: stonewashed denim, lighter in color, softer and more form-fitting than the competitors. This initial chain of command later led to the earlier break-up of the brothers' cooperation with Georges selling his share of the Guess company to his other brothers due to a disagreement in a choice of product distribution strategy. Georges wanted to keep Guess in only the more exclusive stores, such as Bloomingdales. The remaining brothers in the disagreement wanted a larger distribution in KMart. Georges hated the idea. Different camps formed within the company, with each pledging allegiance to either Georges or the other three. Georges eventually gave in and sold his stake to his brothers in September, 1993 for $214.2 million. To finance the purchase, they had to borrow $210 million, and $105 million was still outstanding three years later. To raise money, the brothers decided to take Guess public. Paul was the only remaining brother to ultimately lead Guess on his own. When Georges Marciano and his brothers were much younger, they opened a series of stores in France under the name MGA before launching Guess in America in 1981, after Georges Marciano first came to America in 1977. Their top seller: unisex jeans. Georges Marciano and his brothers moved to Los Angeles to see if they could pull off a similar feat, borrowing a mottled wash Georges had noticed on jeans in an Italian laundromat he had taken note of (at the time, jeans styles were only sold in indigo blue or bleached). The founder, Georges Marciano, and his brothers moved to Los Angeles in 1981 and opened the first store in upscale Beverly Hills area. Armand and Paul joined Georges and his brother in California. Georges came up with the company name after driving past a McDonald's billboard asking drivers to "guess" which eatery had the biggest cheeseburger. Maurice Marciano said, "Georges came home and said, 'I think I found our name. Guess.' "
Maurice Marciano tossed up ideas until he got exasperated, and finally his brother, Georges, clarified himself. The Guess name was born. Guess, with its red triangle patch, stonewashed denim and signature zipper sliding up each ankle, was officially launched in late 1981. In just one year, sales through Bloomingdale's and Guess's Beverly Hills store hit $6 million. Guess soon began advertising, and in 1985, introduced some black-and-white ads. The ads have won numerous Clio Awards. Their fashion models have included a number of supermodels, many of whom, such as Claudia Schiffer, Anna Nicole Smith, Eva Herzigova, Valeria Mazza, Kate Upton, Julia Lescova, and Laetitia Casta, first achieved prominence via these ad campaigns. In the 1985 Robert Zemeckis movie, Back to the Future, Marty McFly (Michael J Fox) wore distinctive Guess denim clothing, which was reportedly designed specifically for the film. The Guess emblem with the famous question mark in the center. During the 1980s, Guess was one of the most popular brands of denim jeans. The company was one of the first companies to create designer jeans. While the first jeans were for women, a men's line debuted in 1983. In 1984, Guess introduced its new line of watches known as "Guess", "Guess Steel", and the "Guess Collection". The watch line is still in existence today (although under different product lines) and has been joined by a number of other accessory sidelines. In 1984, they also introduced a line of baby's clothes, called "Baby Guess". The line is now incorporated with clothing for toddlers and kids called GUESS kids. In the 1990s, Milica, Aleksia and Milos had a division called Guess Home, which featured youthful, upscale bedding collections (Guess was the first company to package each sheet, duvet and pillowcase pair in packaging actually made from sheeting material, to showcase what the pattern really looked like) as well as a number of towel collections. By the end of the decade, sales dropped and Guess discontinued their home division. In the 2000s, the controversy that surrounded the company during the nineties (see below) was largely forgotten. Recently, the clothing and accessories company has redesigned itself, offering several new aspects. Since Guess was looking to make its impact once again on the fashion market, the Marciano brothers called upon random celebrity Paris Hilton to feature in a new series of ads back in 2009. On January 26, 2001, Guess Inc. restated previous results for fiscal 2000 after deciding to write down impaired inventory. In 2004, Guess celebrated the 20th anniversary of its watch collection, issuing a special-edition Guess watch. The accessories department was also greatly expanded and several stores across the United States were redesigned. Guess also created a lower priced collection sold exclusively through its outlet locations. Guess also introduced its first brand extension, the up-scale female line of clothing and accessories, named Marciano. In 2005, Guess began marketing perfume. The company introduced Guess for Women in the spring of 2005. Guess introduced the Guess for Men line in the spring of 2006. 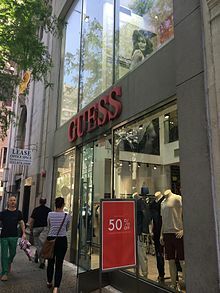 Guess has also continued its Guess Kids clothing line into the 2000s, and in 2006, Guess began promoting the clothing line for girls and boys through its factory retail stores. Guess continued to be guided by the Marciano brothers, as co-chairmen and co-CEOs. Maurice Marciano has overseen the design and its sales growth, while Paul managed the image and advertising. The company operates in many countries around the world with the majority of their stores located in the United States and Canada. Guess has licensees and distributors in South America, Europe, Asia, Africa, Australia, Latin America, and the Middle East. Guess has been proven to be highly successful in South Africa with stores located in almost every major city of the country, with Guess Century City, V&A Waterfront (Cape Town - Western Cape), Sandton City (Gauteng), Menlyn Park (Pretoria - Gauteng) and Gateway Mall (Kwazulu Natal) stores being the most notable. In 2012, 23 years after first posing for the brand, supermodel Claudia Schiffer posed again for Guess' black-and-white ads marking the brand's 30th anniversary. In 2015 it was announced that founder Paul Marciano will be stepping down from his position as CEO with Victor Herrero as his carefully selected replacement, in August of that same year. As of 2017, ex Fifth Harmony member and "Havana" singer Camila Cabello was announced as the new face of Guess. As of 2018, Jennifer Lopez is the new face of Guess. During the 1980s, the company's image was damaged when allegations of sweatshop labor use surfaced throughout a few brands, and Guess was quickly marked as a major offender. In 1992, Guess contractors faced litigation from the US Department of Labor (DOL) due to failure to pay their employees the minimum wage or adequate overtime. Rather than face a court case, $573,000 in back wages were paid to employees. Soon afterward, Guess promised to monitor their contractors for illegal activity, and the company earned a place on the US DOL's 'Trendsetters List', but this position was suspended several years later in 1996 after independent inspectors found violations of regulations at seven of the company's contractors. In that same year, the company was sued by the Union of Needletrades, Industrial and Textile Employees (UNITE), again due to the failure to pay the minimum wage or overtime to workers. The settlement, supervised by the US Department of Labor, saw the reinstatement of 8 workers found to have been illegally fired and another $80,000 in back pay given to workers, but almost immediately afterward Guess announced that it was moving its sewing production to Mexico. The company denied that the move was related to these court cases, but its public image continued to suffer. Throughout the 1990s, UNITE continued a public relations campaign against Guess, focusing on the experiences of former employees. Billboards subsequently appeared in Las Vegas, Los Angeles, and New York City featuring a photograph of Rage Against the Machine with the caption "Rage Against Sweatshops: We Don't Wear Guess – A Message from Rage Against The Machine and UNITE. Injustice. Don't buy it." Eventually, Guess countered with a defamation suit against Unite and several of its officials, while in 1997 the company ran full-page ads in many major American newspapers claiming that its contractors were "guaranteed 100% free of sweatshop labour". The wording of these ads was changed after federal authorities complained that the claims had not been made by anyone in the government and had no official status. Guess especially began expanding in the less competitive and increasingly lucrative European and Japanese markets. In 2005, Guess pulled a line of T-shirts from the market after Erika Becker-Medina, a D.C. area resident and government employee, spearheaded a campaign calling for the boycott of the company. "Ski Colombia: Always Plenty of Fresh Powder" was embossed on the T-shirts which were released by the company in the second quarter of 2005, apparently in reference to Colombia's drug-trafficking problem. Guess distributed letters of apology. ^ "GUESS?, INC. REPORTS FIRST QUARTER RESULTS". ^ "Company general information". craft.co. ^ a b c "Guess, Inc. Company History". Funding Universe. Retrieved February 5, 2012. ^ Meet New Guess Girl Alyssa Miller!. Teen Vogue. ^ Brockes, Emma (10 April 2009). "Emma Brockes talks to Michael J Fox about Parkinson's disease" – via www.theguardian.com. ^ "Guess kids". Retrieved 5 February 2012. ^ "History of Guess, Inc. – FundingUniverse". www.fundinguniverse.com. ^ "Guess Profile". Fashion Model Directory. Retrieved 5 February 2012. ^ "New Guess Concept Store Opens in Europe". Retrieved 6 February 2012. ^ "Guess? warns of Q4 loss, weaker-than-expected 2001". Dow Jones Reuters. ^ Sofroina Timmons. "GUESS! Who? GUESS by Marciano!". ^ Krupnick, Ellie (28 March 2012). "PHOTOS: Claudia Schiffer Returns To Guess For 30th Anniversary". Huffington Post. ^ "Guess founder Marciano to step down as CEO". LA Biz. ^ Nast, Condé. "Camila Cabello Just Did the ONE Thing She Never Did With Fifth Harmony". Teen Vogue. Retrieved 2018-11-30. ^ "Jennifer Lopez announced new face of Guess Spring 2018 campaign". Grazia Australia. Retrieved 2018-11-30. ^ "Guess? What". New Internationalist Magazine. Retrieved 6 February 2012. ^ "All in the Jeans". Slate Magazine. Retrieved 6 February 2012. ^ "RATM: timeline". 21 November 2007. Archived from the original on 21 November 2007. ^ "404 - Soubor nebo adresář nebyl nalezen". www.skmoda.sk. Archived from the original on 2012-03-21. ^ "Guess Clothing Stores Quit Selling Drug T-Shirt". ^ "Guess Who's Unhappy With the IRS?". Brown & Company. Retrieved 6 February 2012. Wikimedia Commons has media related to Guess (clothing).